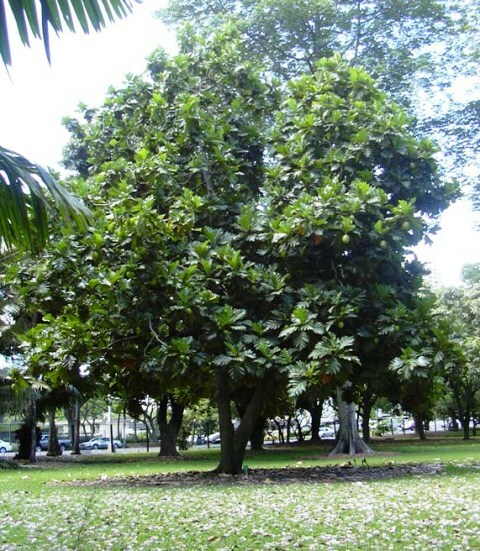 Bread fruit (Artocarpus altilis) is grown throughout the tropics. It is used more as a vegetable than as a fruit. It is eaten after cooking and may be boiled, baked, roasted, fried or made into soups. It is usually cooked after peeling and slicing and makes a good delicacy in combination with ingredients like coconut cream or grated coconut meat. Chips and biscuits can be made from it. The leaves can be fed to livestock. Hot, humid, tropical lowland is suitable for its cultivation. The annual rainfall of 1,500-2,500mm and a temperature of 21.1 C-32.2 C is ideal. Young plants grow better under shade during the initial years. However, these will require full exposure to sunlight later. It can be grown on a variety of soils provided sufficient depth and drainage is there. June-December is planting time. Pits of 60cm x 60 cm x 60 cm size are dug at a spacing of 10-12m. 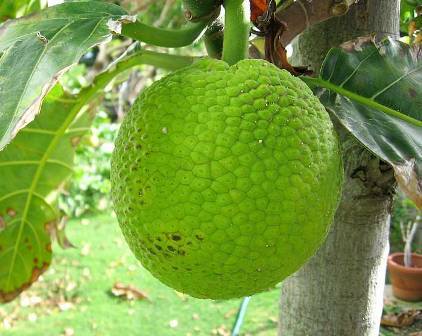 There is no exclusive fertilizer recommendation for bread fruit. Organic manure @ 25 kg/tree can be applied. Depending upon the age of the plant, NPK mixture (7:10:5) @1- 2kg/plant can be applied. 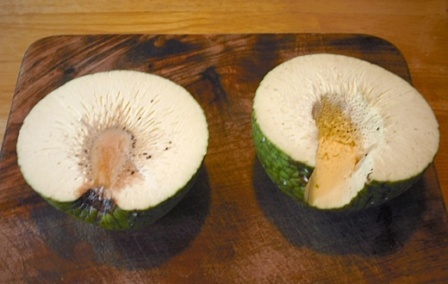 Since bread fruit has no seeds, so it is propagated vegetatively. Root cuttings about 2.5cm in diameter and 20 cm in length are planted horizontally or at an angle in shaded beds. Root suckers also can be used as propagules. Air layers made from off shoots can also be used for planting. Irrigation should be given during summer which helps to check fruit drop. Spraying of Bordeaux mixture (1%) controls fruit rot especially during rainy season. The tree comes to bearing in 3-6 years depending upon the type of planting material used. The fruits are harvested 60-90 days after emergence of inflorescence. Fruits are available during February-March and June-August. A fully grown tree can yield about 500-2,000 fruits, weighing 1-4 kg each.